By growing Green Beans or Runner Beans as they are also called, you will have an abundance of fresh nutritious vegetables. They arrived from South America not long after the French Bean and were initially grown for their looks - what a waste. We now enjoy growing Green Beans for looks AND healthy eating. It is in Britain they are called Runner Beans and in the USA - Pole or Green Beans. But in Britain they are one of our favourite home grown beans and can be seen in summer growing up cane wigwams or clambering through netting or indeed any structure that allows this delicious vegetable to entwine itself. When growing Green Beans a 3.6M row can produce upwards of 27Kg of beans from August to the first frosts of winter - WOW! Remember - growing Green Beans of this type is easy to learn but don't treat it as an easy plant to grow. The ground will need to be prepared in winter, regular watering in summer... especially in dry weather and when the pods are forming. During harvesting in late summer - do not - let any pods reach maturity as this will stop the flowers from forming. So picking very regularly is essential for continual vegetable production - be a good neighbour and give some away. 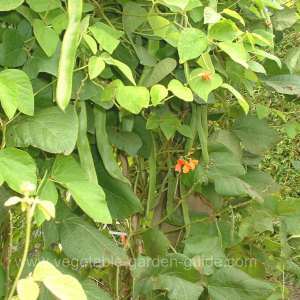 Runner Beans must have a rich and deeply dug soil (pH6.5-7.0) in a shelterd part of the garden, lime if necessary in late winter as acid conditions are undesirable. Foliage is dense and so wind damage could occur if too exposed - also ensure that the shade cast by these plants will not be a problem to other growing vegetables. Green beans will tolerate some shade but full sun is preferred. If you're growing Green Beans like Pole or Runner Beans in a row, dig a trench during the autumn or winter 45(18")cm wide to a spade's depth. Dig plenty of well rotted compost or manure into the soil in the bottom of the trench - this will ensure the vegetable plants will get all the nutrients and trace elements they need as well as helping to retain moisture around the roots. 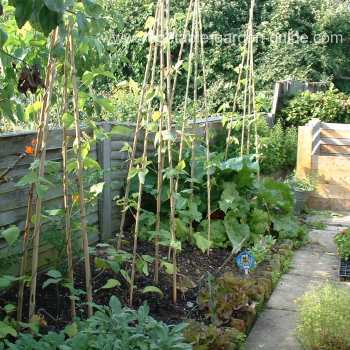 If your growing your Pole or Runner Beans up a wigwam frame dig the compost or manure into a large circle of ground over which your wigwam will be erected. 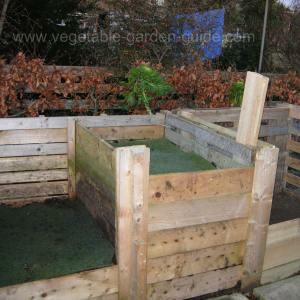 If you have the space, don't forget to make room near your vegetable growing plot for a composting area. Once you have made your own compost for a first time you will be hooked - it's an amazing process... truly truly amazing!... and your green beans will love it. Two weeks before sowing or planting rake in a general fertilizer. Pole or Runner Beans are easily damaged by frosts. To minimise this when growing Green Beans sow their seeds indoors in a light airy place or in your greenhouse. Sow the seeds into pots (two beans per pot) in April. Thin the plants leaving the strongest to to be planted out. If you like, leave them both in the pot and plant out together as one root ball - they will grow and give you a great crop. Harden off for planting out in late May or June - or earlier if you know your weather. First erect a structure of poles(bamboo canes - I use 2.4M(8ft) canes) for your green bean plants to grow up. Form a double row of poles 45cm(18") wide along the length of your prepared bed and push the poles into the ground 25cm(10") apart. Draw each opposite pair of poles together and tie them about 15cm(6") from the top or use a universal cane support. Insert a pole horizontally in the V shapes that are made by doing this and tie this pole in, this creates a stabalising ridge pole. If you grow more than one double row leave 1.5M(5ft) between double rows. Use a wigwam frame if space is short. Place a single pole at the centre then measure 40cm(15") out from the pole in the north, south, west and east directions and push a pole into the ground at each point. Then measure again from the central pole 40cm(15") to each point in between the four you have just done - pushing a pole into the ground at each point. Draw all the poles at the top to the centre around the central pole and tie them together about 15cm(6") from the top - a large cable tie from you DIY store is good for this. This will give you 9 poles to grow your Runner Beans up - enough for a sizeable harvest. Make a hole at the base of each pole 5cm(2") deep and pop in a couple of seeds, then cover the seed with soil. If both seeds germinate then thin out the smallest or just leave them to grow. Sow a few extra seeds at the ends of each row to use as transplants for any that fail to germinate along your rows. When growing Green Beans, a second sowing in June in mild areas will give a welcome crop in October. To further ensure your success at growing Green Beans, purchase seedling plants from your nursery or garden centre. When all signs of frost has passed plant them out along your rows of poles or around your wigwam structure. This method is strongly recommended if you live in cold areas. Water your seeds or seedlings on completion. 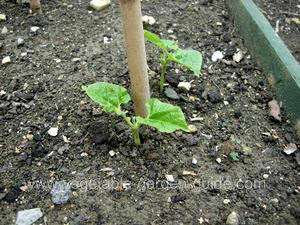 At the end of the growing season dig in the roots of your Runner Beans as they will make excellent nitrogen fertiliser. The roots have the capability to extract nitrogen from the air and store or 'fix' it in small nodules on their roots. So don't feed your Green Beans excessively with nitrogen fertilisers. Cultivation facts Not very easy. Good soil preparation, regular picking and support are essential. Black Bean Aphids adore Green Beans - keep a dilligent watch for their appearance. A serious infestation will badly stunt plant growth. Check over the leaves and stems of your Runner Beans, especially the tender growing tips... gently squish any colonies you find - gently for the sake of plant not the aphids ;0). Go into your vegetable garden at night with a torch and collect the slugs by hand - they can be disposed of by placing in a box containing salt. Place barriers around the plants... something rough that makes it difficult for them to slither on - like egg shells or sand. Or cover your seedlings with plastic bottles with both ends cut off and pressed into the soil over them. 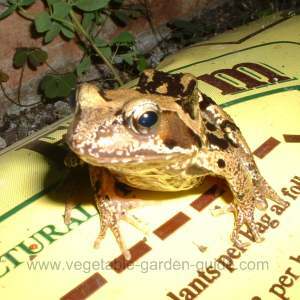 I live next to a small stream so I am blessed with lots of frogs in my vegetable beds - they love slugs - I disturbed this little fella whilst I was watering my peppers in the greenhouse. Halo Blight is a disease that there is no cure for. Small brown spots appear on the leaves and each one is surrounded by a yellow 'halo'. Unfortunately this causes your growing Green Beans to produce fewer pods and the plants themselves become stunted. To minimise blight problems don't soak seeds before planting - the blight is in the seed. Use only seed purchased from a reputable source - your friend might have meant well when sharing his saved seed from last year - I personally would not take the chance. Dig up infected Runner Beans and destroy. Lack of moisture at the roots ie. poor watering regime. Poor weather conditions causing a decline in insect life which affects fertilization. I grow Moonlight Green Beans which are self polinating and white flowered - which seem less desirable to birds. The debudding of the flower spikes caused by birde who love to eat those young tender flower buds. For two of the above problems you can be pro active. If you see birds getting at your growing green beans then protect them with a netting barrier. As far as watering is concerned, make sure you give them plenty. But I'm afraid the bad weather and low count of insect life just has to be lived with :0( . Harvesting can begin in July but the main months are August to October. Aim to harvest your growing Green Beans when they are young, tender and succulent - not to show off some monster that have strings in them like old rope. Pick regularly once the pods have reached a decent length of 15-20cm(6-8") but ensure they are picked before the beans inside begin to swell. By doing this - it may mean picking every day or two - the harvest period can go on for 6-8 weeks. Production will stop if you allow even a few to ripen. If you have a glut of green beans then freeze some, give some away or compost them - I know... it does'nt bear thinking about - but the point is... don't stop picking. They will also stay fresh in the refrigerator if sealed in a plastic bag for up to a week, or in an open container in the kitchen for 3-4 days. So there you have it - if done properly growing Green Beans like Runner Beans will reward you with a fantastic harvest from a small space planted up with just five or six plants. Do give them a go... you won't be disappointed.